FastNetMon has bundled ability to store all traffic inside special column-oriented database. You could store all traffic inside it and retrieve it using well-known SQL syntax. You should have working instance of FastNetMon before using this guide. Also, you need to install visual traffic stack because we use Grafana for traffic persistence too. It’s mandatory step if you are interested in ASN tagging for your traffic. If your device populates it in Netflow v5/v9 and IPFIX stream you do not need it. 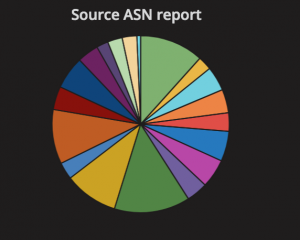 As output, you could find number of packets per destination ASN for required time slice.